Star Wars Legends Epic Collection: The Old Republic Vol. 3 Review – AiPT! A wonderful collection of very fun, exciting and action-packed adventures. Volume 3 of Marvel’s Star Wars Legends Epic Collection: The Old Republic comes out this week. This volume is a collection of Knights of the Old Republic issues #38 – #50 (2009-2010) as well as a five-issue limited series Knights of the Old Republic: War from 2012. 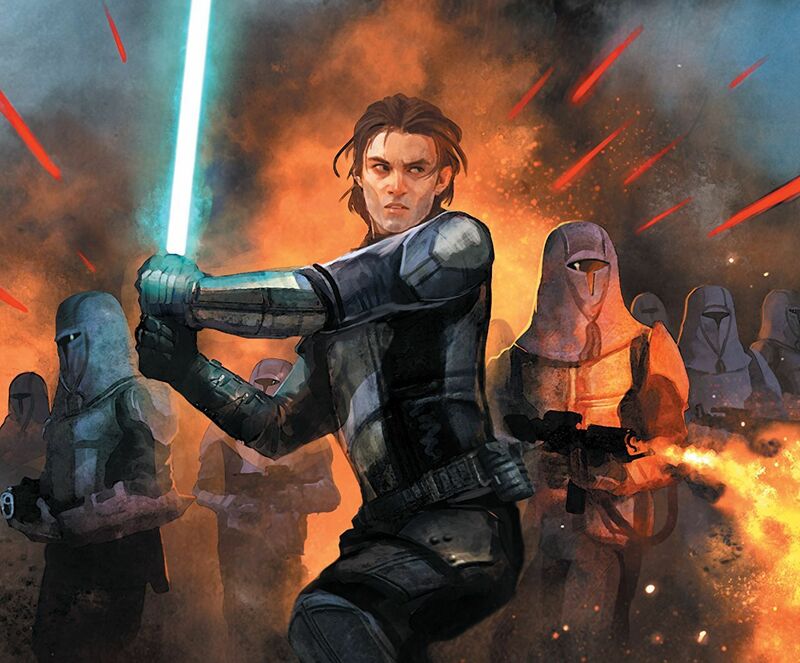 The 400+ page collection contains seven stories centering around ex-Jedi Padawan and former murder suspect Zane Carrick, and the crew of the Hot Prospect comprised of his partner in crime Gryph, the mysterious and beautiful Jarael, a Mandalorian deserter named Rohlan Dyre, Trandoshan pilot Slyssk, and last but not least, the somewhat moody loading droid Elbee. The volume starts out with a one-issue story titled “Faithful Execution.” The Hot Prospect comes upon a missing luxury vessel, the Chancellor Fillorian. As the crew boards the derelict craft, they discover that everyone on board is dead, seemingly strangled somehow. Upon further investigation they find a lone survivor, a small and seemingly harmless creature named Toki Tollivar and his droid assistant. Things are not as they seem as they all soon discover that Toki is a murderous Sith adapt, responsible for killing everyone aboard the entire ship and countless others before that by use of Force choke. Zane and Toki clash in an epic lightsaber duel as our hero fights to save his friends and stop the evil creature from killing anyone else. The next tale is the three-issue story “Deuling Ambitions” about Jervo’s World, an arena style station floating just above the surface of a planet. The arena hosts one of the galaxy’s most exciting and lucrative competitions, Ariel Swoop Bike Dueling. As Zane, Gryph,and Jarael watch the qualifying rounds, the young hero is suddenly inspired to pursue his childhood dream of being a swoop bike duelist and enters the competition. Meanwhile, Rohlan decides to leave the ship and venture around, only to be discovered by the station’s security detail. Jarael quickly and cleverly tells the guards that Rohlan is not really a Mandalorian, only wearing the armor as a character costume to compete in the duels. This ruse saves Rohlan from being captured but also forces him to compete as a duelist as well as a result. During the events of the duel, Zane meets his childhood hero Goethar Kleej, a multi-championship winning dueling legend. Goethar informs Zane of the cruel and brutal nature of competition as well as how the Proving Grounds are regularly supplied by slavers with children and kidnaped citizens, taken from their homes and forced to train and fight in the duels. Another great story in this volume is “Masks” which tells the story of the Jedi Revan and what caused him to call the Jedi in to assist the Republic in fighting against the Mandalorians. It also gives insight into Malak’s relationship and connection to Jarael and hints of her true abilities in the Force. The next story is “The Reaping” in which Zane and Jarael travel to a mining station posing as slavers for The Crucible. Zane soon discovers that the Dust Divers, who are forced to go down and gather the nanocrystals from this hostile and deadly environment, are being killed at an alarming rate. Zane decides to rescue all of the Dust Diver slaves rather than make a profit off crystal harvesting, much to the dismay of Gryph. Their activities draw the attention of the real Crucible and Jarael finds herself face to face with ghosts from her past. The collection contains a couple more interesting and exciting stories, “Destroyer” and “Demon,” before concluding with the intense and action-packed “War”. In this five issue series, Zane heads out on a trip home to see his family and suddenly finds himself detained at customs and immediately drafted by the Republic to fight in the Mandalorian War. Joining the Republic forces on the battlefield is a small group of Jedi Knights led by a former Jedi High Council member Dojander Kase. In a shocking and dramatic turn of events, Kase reveals that he his Jedi are really Mandalorian Knights now and have been indoctrinated into the Mandalore ranks to fight against the Republic. Kase takes Zane and Morvis prisoner, forcing them to fight alongside the Mandalorians as well while Zane desperately does everything in his power protect the innocent and bring peace to both sides. All of the stories are written by John Jackson Miller with the exception of a small standalone black and white excerpt from Star Wars Tales #24 titled “Unsern, Unheard,” which is written by Chris Avellone. The writing on this series is superb. Miller takes the reader on an amazing journey alongside some truly wonderful and unique characters that are written and developed in a way that fits the world of Star Wars seamlessly. The stories are exciting and compelling full of intense drama and some surprising plot twists. There are also wonderful moments of humor and heart woven throughout. The dynamic between Zane and Gryph in particular is rather comical, and whenever they come up with a plan to make some money, Zane always seems to mess things up by trying to do the right thing and help others in need. Miller writes these characters in a way that makes them feel genuine and relatable. As the story progresses the characters really seem to grow and develop from their struggles and experiences, adding a real depth and dimension to the character and story arcs. This collection also contains some brilliant artwork. There are various artists on the different stories, with a good majority done by Brian Ching. The four stories that he does artwork on are simply beautiful. The action sequences are exciting and visceral and every panel is full of deep visual narrative and gorgeous to look at. Ching also does a brilliant job with his use of detail while also keeping it simple and concise. Another highlight visually to this collection is the work that Andrea Mutti does in the five-part series “War”. Her work is masterful and has more of a raw intensity which really enhances the drama and situations of the Mandalorian War. Finishing everything off visually and bringing the images to life with vibrant exciting color is the amazing work of Star Wars veteran colorist Michael Atiyeh. Like Miller, Atiyeh is the sole colorist on the series. This brings an overall continuity to the visual aspect of collection and Atiyeh masterfully adapts and adjusts his use of color and shading to the styles of the artists to really complement and accentuate the images on the page. For example, on the polished detailed style of Brian Ching’s work, Atiyeh incorporates deep, vibrant, rich colors, making every panel pop with action and excitement, whereas with Andrea Mutti’s darker and more dramatic stylings on “War,” he incorporates more gritty and earthy tones. Atiyen’s ability to adapt and change things up to best enhance the different styles and artists in this collection is a true testament to his experience, skill, and to the quality of his craft. Overall, this is an incredible collection a stories about new and unique characters from a different time in the Star Wars universe that are new and exciting, yet are written and drawn in a way that feels like they fit perfectly within the context of the Star Wars universe. The writing is masterful and complex and every story is beautifully drawn and crafted brilliantly. I highly recommend this collection to any fans of Star Wars interested in exploring a different time full of strange worlds and new, exciting adventures. Volume 3 of Marvel's Star Wars Legends Epic Collection- The Old Republic is wonderful fun! It is brilliantly written and masterfully crafted full of drama, excitement, humor, and heart.